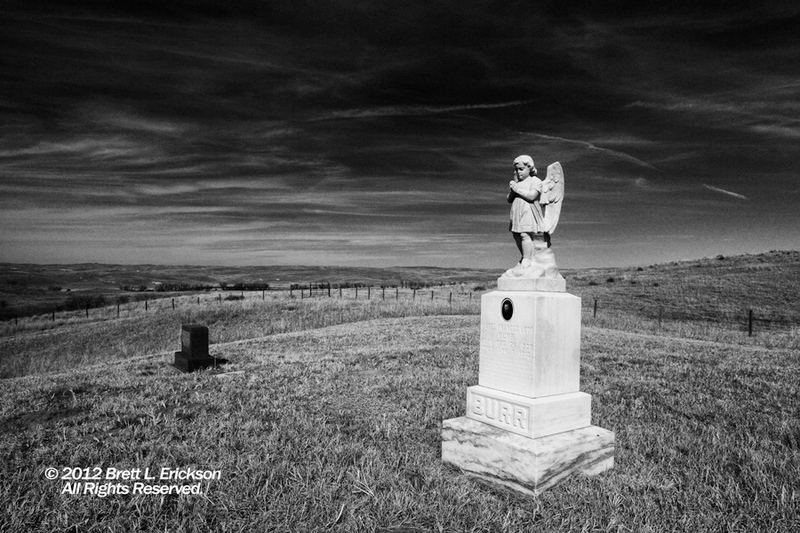 In Whitman, Nebraska, a lonely cemetery sits atop a hill overlooking town and the vast, rolling expanse of the treeless Sand Hills. Eerily, a photograph of Mabel stares out at us, as if she waits, entombed in the marble, for the infrequent visitor to realize that the frontier demanded payment from more than adults. Brett – I love cemeteries, and this is just a fantastic photo. You did such a good job of capturing both the sadness of Mabel’s short life and the grandeur of the country. So glad you like it-the scene really resonated with me when I found it, since my daughter is the same age at Mabel at the time of her death. I wither at the thought of such a loss. Thanks–felt a wee bit eerie as I composed the shot. Gave me the willies. I’ve added a reading list page for everyone’s convenience, featuring books I require in my classes or recommend to my best students. Thought you’d like that. This is gorgeous. Love your work and always look forward to more. Mabel Frances Leon Burr known as Dolly was my Grandmas sister – I have seen the stone and think this is a wonderful picture . How amazing! I’ve been so moved by this grave, and I’m even moreso now knowing she’s remembered by family!